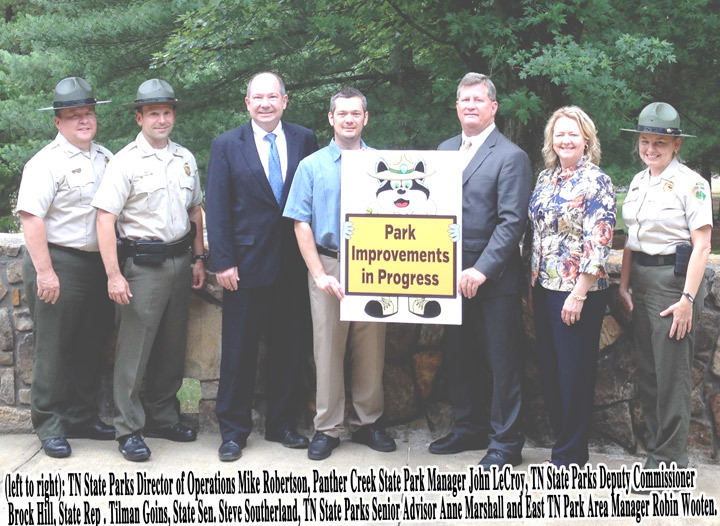 Tennessee State Parks celebrated the grand re-opening of the Panther Creek State Park 50-site campground on June 30 with state and local officials. The campground received upgrades to 50 amp electrical service, site improvements and new bathhouses. Wi-Fi will be installed at the park in the near future. The 1,435-acre park is located on the Cherokee Reservoir in the historic Holston River Valley near Morristown. Panther Creek offers 17 different hiking trails covering more than 30 miles of terrain, at all levels of difficulty. Hikers can enjoy magnificent views of Cherokee Lake and the Cumberland Mountains from Point Lookout Trail reaching 1,460 feet above sea level. There are also more than 15 miles of mountain biking trails that range from easy to difficult. Panther Creek also offers seven miles of horseback riding trails. Cherokee Lake provides year-round catches of bass, crappie, bluegill, catfish, rock fish and bream. For more information, visit http://tnstateparks.com/parks/about/panther-creek. Chattanooga Shines, From the Newsroom, Who is winning the political race? CHATTANOOGA, Tenn. – – WTCI-PBS and the Chattanooga Times Free Press will host a Republican primary Congressional debate for the citizens of the 3rd Congressional District. Congressman Chuck Fleischmann and the Republican primary challenger, Weston Wamp, have agreed to participate in a debate on July 2nd, 2014 at the WTCI studio at 7540 Bonnyshire Drive. Dave Flessner, Chattanooga Times Free Press Business Editor, will moderate the debate. Viewers can watch the debate broadcast on Wednesday, July 2nd at 8pm on WTCI or streaming at wtciTV.org and timesfreepress.com. “We’re grateful the candidates have agreed to participate in this debate. It’s our mission to inform viewers about the issues that matter in their lives, and we believe the community’s daily newspaper and the community’s PBS station are a perfect fit in making this a reality,” says Paul Grove, President and CEO of WTCI. WTCI and the Times Free Press are looking forward to hosting a second debate after the primary election. All eligible candidates will be invited to participate in a general election debate as the November election approaches. SACRAMENTO, Calif.-June 26, 2014 – California Assembly Speaker Emeritus John A. Pérez and State Senator Kevin de León today honored Olympic gold medalist and 10-time world champion boxer Oscar De La Hoya for his many accomplishments in boxing and business, and contributions to the California community. Assembly Speaker Emeritus Pérez and Senator de León recognized De La Hoya from the senate and assembly floors during a presentation at the California State Capitol. De La Hoya thanked his family, friends, fans, and community in brief remarks from the California State Senate and Assembly floors following the recognition presentation. De La Hoya, known as “The Golden Boy,” was born to Mexican immigrants in Montebello, California. Raised in a family that included amateur and professional boxers, he began boxing at the age of six. De La Hoya is one of the most popular and talented athletes in the history of boxing, having won a gold medal at the 1992 Olympics at 17 years old and 10 world titles in six different weight classes. He was inducted in to the International Boxing Hall of Fame on June 8, 2014 in Canastota, NY as part of an All Star class that included rival Felix “Tito” Trinidad and undefeated Super Middleweight World Champion, Joe Calzaghe. De La Hoya invested back in his community of East Los Angeles following his success in the ring. In 1995 the Oscar De La Hoya Foundation was created to bring a better quality of life to thousands of people in East Los Angeles. The Foundation supports the Oscar De La Hoya Ánimo Charter High School, and the Cecilia Gonzalez De La Hoya Cancer Center and Oscar De La Hoya Children’s Medical Center at White Memorial Medical Center. The Foundation also supports numerous after-school programs that guide young people toward leading positive lives and away from gang violence, juvenile delinquency, and substance abuse. In addition to boxing, De La Hoya is an accomplished businessman and singer. He established Los Angeles-based Golden Boy Promotions in 2002 and became the first Hispanic to own a national boxing promotional company. In 2000, he released his first album, in English and Spanish, which topped Latin dance charts and had a single, ‘Ven a Mi,’ that was nominated for a GRAMMY award. AVISO PÚBLICO: La Organización de Planificación del Transporte Regional Knoxville – Reunión del Comité Técnico, 8 de julio de 2014. El Comité Técnico de la Organización de Planificación del Transporte Regional Knoxville (TPO) se reunirá el martes 8 de julio a las 9 horas, en el Salón denominado Small Assembly Room del edificio City/County Building, localizado en 400 Main Street, Knoxville, TN. 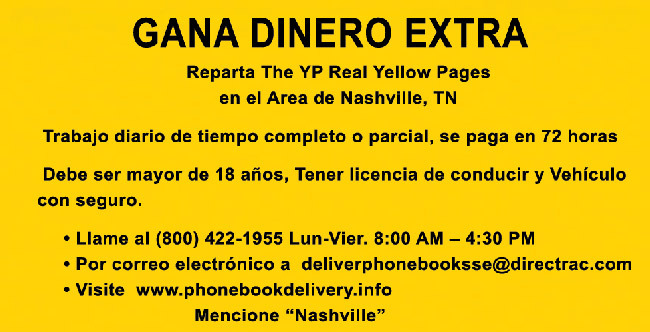 Temas a tener en cuenta: Enmiendas propuestas al Programa de Mejoramiento del Transporte del año fiscal 2014-2017 para incluir los proyectos financiados con las Secciones 5307 y 5339 de los fondos FTA para la ciudad de Knoxville, Agencia de Recursos Humanos del Este de Tennessee y del Comité de Acción Comunitaria del Condado Knox y para el desarrollo de un estudio para un parque lineal de vía verde que corra en paralelo a la carretera estatal US 444 desde Hwy 321 sur hasta State Hwy 72, Revisión del Proyecto final del Programa de Trabajo de Planificación del Transporte del año fiscal 2014-2015, Actualización de la legislación federal; y otros asuntos. PUBLIC NOTICE: Knoxville Regional Transportation Planning Organization – Technical Committee Meeting, July 8, 2014. The Knoxville Regional Transportation Planning Organization (TPO) Technical Committee will meet on Tuesday, July 8, at 9 a.m. in the Small Assembly Roomof the City/County Building, 400 Main Street, Knoxville, TN. Topics to be considered: proposed Amendments to the FY 2014-2017 Transportation Improvement Program to include projects funded with FTA Sections 5307 and 5339 funds to the City of Knoxville, East Tennessee Human Resource Agency and Knox County Community Action Committee and for development of a study for a linear park greenway to run parallel to State Hwy 444 from US Hwy 321 south to State Hwy 72, review final Draft of the FY 2014-2015Transportation Planning Work Program, federal legislation update; and other business. Night Moon Productions, LLC presents the Knoxville Women’s Expo Saturday and Sunday, July 12th & 13th at the Knoxville Expo Center, 5441 Clinton Highway. Southern Women Laugh, Southern Women Love, Southern Women Live! Join us for the Knoxville Women’s Expo! Two days of shopping, food, entertainment, contests and fun! Live Entertainment from Johno, Jesse Gregory, Laurel Wright, Comedian Danny Whitson and Hip Hop Dance Group Phla’less. A chance to compete in One Minute for One Direction to win tickets to see the hit group One Direction in Nashville! Tickets are $5.00 per person for age 16 & up. Parking is FREE! Sponsored by Q100.3, Xfinity, Sugarbakers, Imagination Forest, Byron’s Printing, Inc., Historic Cherokee Caverns and Southern Grace Mercantile. (CANASTOTA, NY): Capping a legendary athletic career that included 10 titles at six different weight divisions; a gold medal and dozens of championship fights, International “Golden Boy” Oscar De La Hoya was inducted into the International Boxing Hall of Fame in Canastota, NY. “Today marks an incredible personal achievement, but it is only the latest milestone that never would have been possible without my family, my friends and, most of all, my fans,” De La Hoya said during the ceremony on June 13th. De La Hoya, 41, went into the Hall of Fame as part of an All Star class that included rival Felix “Tito” Trinidad and undefeated Super Middleweight World Champion, Joe Calzaghe. Hours before the official induction ceremony, De La Hoya announced a $50,000 donation to the International Boxing Hall of Fame to mark the landmark’s 25th anniversary. “We must put aside the egos that have damaged our brand and sullied our reputation. We, the promoters, must stop carrying petty grudges that serve no purpose but to divide our sport. And most important, we must give the fans the fights that they want,” De La Hoya said. June 12, 2014 – Knoxville, TN – Today, seventeen road workers who brought a federal civil rights lawsuit against their former employers, Monroe County, Tennessee government and its Road Superintendent, Steve Teague, reached a $500,000 settlement. Following the August 2010 county elections, on September 1, 2010, newly elected Monroe County Road Superintendent Steve Teague eliminated the jobs of workers who had supported his political opponent. Shortly thereafter, 17 of these workers who lost their jobs filed a lawsuit in federal court in Knoxville alleging that their First Amendment right to political speech was violated by Mr. Teague retaliating against them for supporting his political opponent. After three days of trial, the parties reached this settlement that Plaintiffs and their counsel hope will send a powerful message to all government officials in Tennessee – that government workers have the right to participate in elections without fear of retaliation from those elected to serve the public. The Plaintiffs are represented by David Garrison and Scott Tift of the Nashville, Tennessee law firm, Barrett Johnston, LLC, and by Ned Pillersdorf of Pillersdorf, DeRossett & Lane of Prestonsburg, Kentucky – lawyers who specialize in civil rights litigation and the representation of employees. “When employees like these county road workers band together to enforce their rights, our system of justice works – by achieving a just settlement for these workers and disclosing their struggle to the public,” said Scott Tift, lead trial counsel for the workers. “We hope that this case will ensure that government officials in Tennessee don’t let their politics trump their oath to abide by our Constitution when it comes to employing those who serve the public,” added David Garrison.